There are so many places to see in Utah, but I wanted to limit myself to a few areas and not drive all over the state. Arches and Canyonlands National Parks and Goosenecks State Park would have been interesting, but were over on the east side of the state. I decided to go as far east as Capitol Reef National Park, then west to Bryce Canyon and Zion National Parks. So, again I was southbound on I-15, heading to Salt Lake City. I was going to meet Mary, who I worked with at Dell but had never met because she worked remotely from Sandy, just past SLC. We planned to have lunch, and I could catchup on Dell news. It’s always fun to meet the folks you work with from across the country/world. 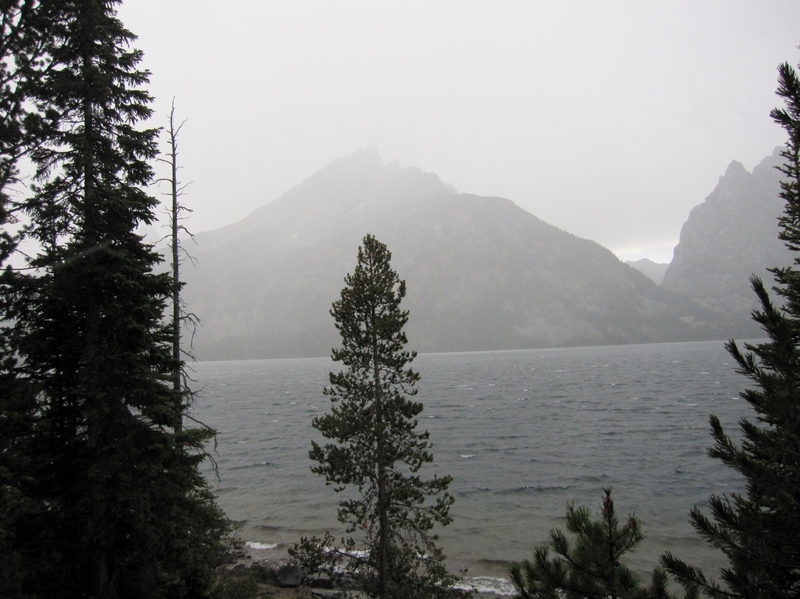 Then I headed to Nephi to camp in the Uinta National Forest. There are some dispersed campsites up Salt Creek Canyon Road. The next day we drove down to Torrey and Capitol Reef National Park. The huge rock faces run for miles to the south and are just stunning. 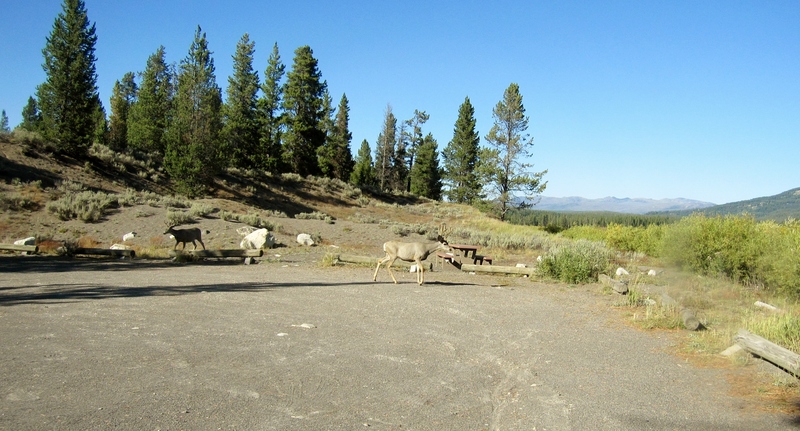 There is a nice campground in the park, but was full. I ended up at a commercial campground in nearby Torrey. From Torrey I took the Highway 12 scenic drive that connects to Bryce Canyon National Park. The road immediately climbs high into the Dixie National Forest and has an overlook above Capitol Reef. Along the way the road passes through some very interesting rock formations. At one point the road is on a thin spine, called “The Hogback”, with the road dropping off of on both sides. Back in Wheatland, WY, Alan (the Englishman I had met) told me about a nice camping spot across the highway from Bryce. It was a good spot to disperse camp for a night. The next morning I drove into Bryce Canyon very early and was able to get a good campsite at Sunset Campground. Found a nice shady site. That way I could leave Riley in the rig for a few hours without it getting too hot in there while I hiked. 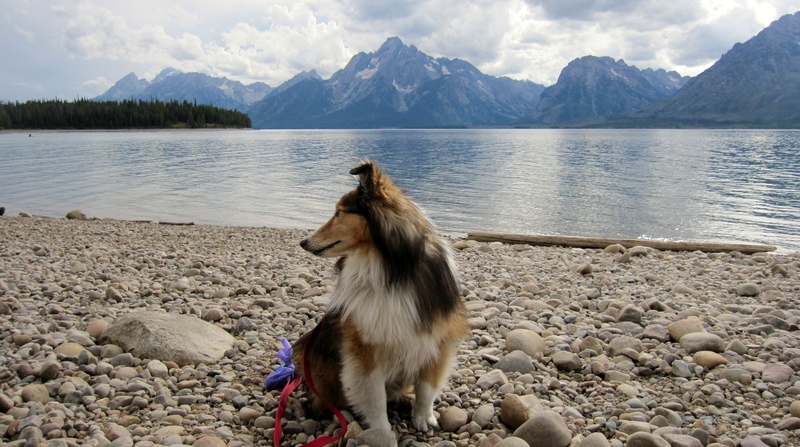 Dogs aren’t allowed on most hiking trails in the National parks anymore. Usually there is one trail in each park that allows dogs. 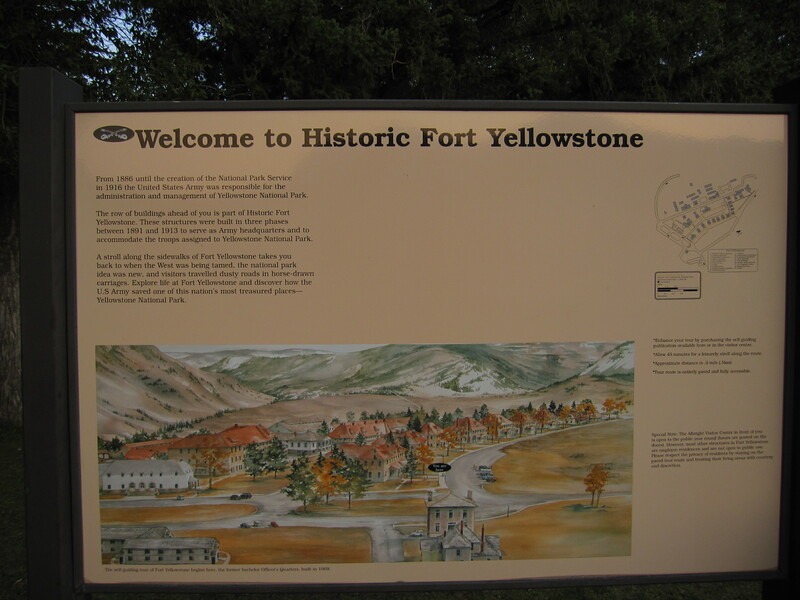 Generally it is some paved trail from the campground to the visitor center, or something like that. In Bryce the trail from Sunset Point to Sunrise Point is dog friendly. So we did that first thing. It was pretty crowded and lots of folks wanted to stop and pet Riley. He is always happy to meet people that want to pet him! Early the next morning we drove to the end of the canyon (Rainbow Point) and drove back, stopping at all of the view points along the way. I decided to stay another night and took the shuttle to Bryce Point and Inspiration Point. At about sunset I took the Navajo loop down into the hoodoos. On the way back up the skies were really stormy looking. I probably took about 400 photos of Bryce Canyon. It’s just gorgeous and changes all day long as the light changes. So glad we stopped there. Here is a gallery of photos. For some reason WordPress isn’t allowing me to create a slideshow. But, you can click on the first photo and it will open into a slideshow. Utah Capitol building. They had several of these painted bulls. Cool skies above the Navajo Loop trail. Thor’s Hammer in the lower left corner. After Bryce Canyon we visited Zion National Park and Best Friends Animal Sanctuary. I’ll write about those in Part 2. Sorry for being so late with this post. I have made some new traveling friends in New Mexico and have ignored updating the blog. Will try to catch up ASAP. Anyway, we drove into Yellowstone the day after Labor Day, hoping to avoid the summer crowds, but before it got too cold. I was hoping to camp in Norris Campground, since it is pretty central and my friend Dwight was camping there on his annual trip. We stopped to see Lewis Lake, Lewis River, and Lewis Falls. 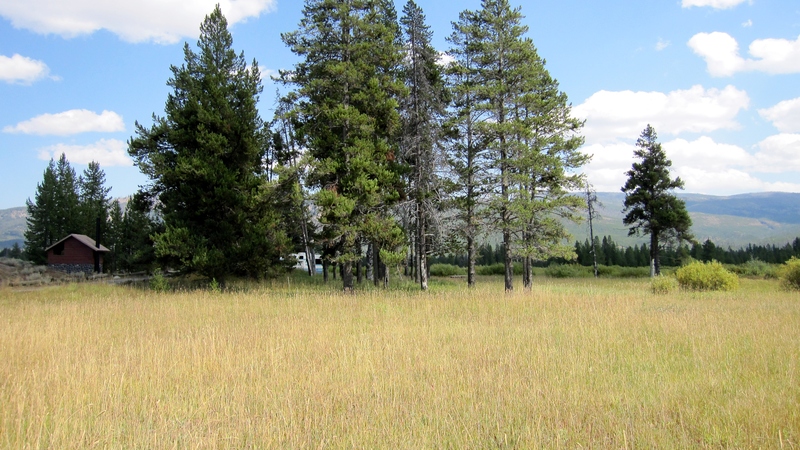 Then to Grant Village on Yellowstone Lake. I had heard there was internet and phone signal there – I had been without for 3 days. The lake is really huge, from what I could see. I was walking Riley, but couldn’t go too close. Dogs are not allowed on the boardwalks that go along the geysers, which are all over in Yellowstone. Probably should have put him back in the RV and gone back out to the lake for a good picture, but didn’t think of it. 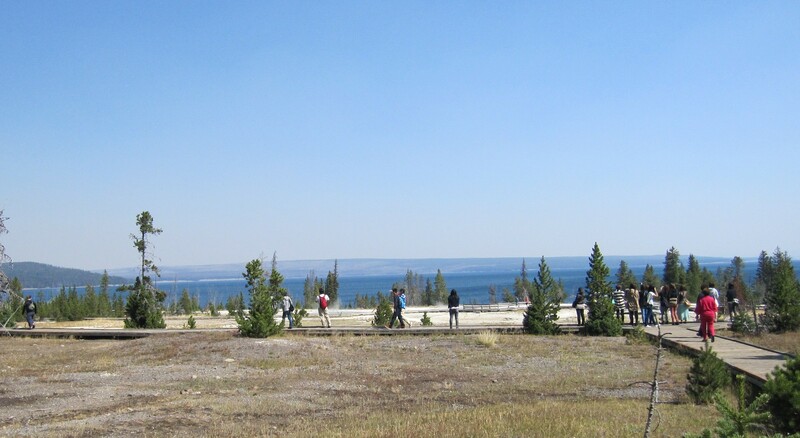 We went up and over the Continental Divide a couple of times, then to Old Faithful. The next eruption was about an hour away. I started to wander around and wait, but decided it would be too long, so bagged it. Needed to get to Norris by early afternoon to get a decent campsite. 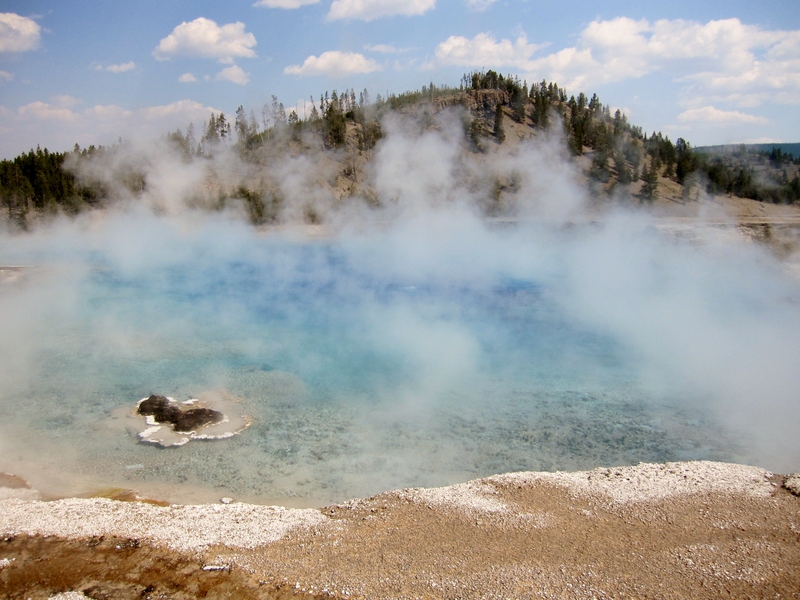 Stopped at Midway Geyser Basin to view the Excelsior Geyser and Grand Prismatic Spring. The hot geyser water drains into the Firehole River (more pictures in the slide show at the end). One thing I wasn’t adequately prepared for is how big Yellowstone is. It’s huge. Takes a lot of driving to get from one place to another. And it’s super-hilly. Anyway, we got to Norris Campground around 3PM and it was full. Drove around to see if I could see where Dwight’s group was camped, but didn’t see him. Had left a message earlier in Grant Village, but had not connected. I decided to drive to Mammoth Campground. Would need gas soon, and I could go to Gardiner the next morning, which is right outside the park, about 5 miles from Mammoth. At Mammoth I got one of the last sites. I met a guy parked above me who was tent camping, but owned a Lazy Daze back in Austin. Small world. Riley and I took a walk around the Mammoth area. A lot of the buildings there are from a time when the park was guarded by the Army. Now they are used for the Visitor Center and residences. 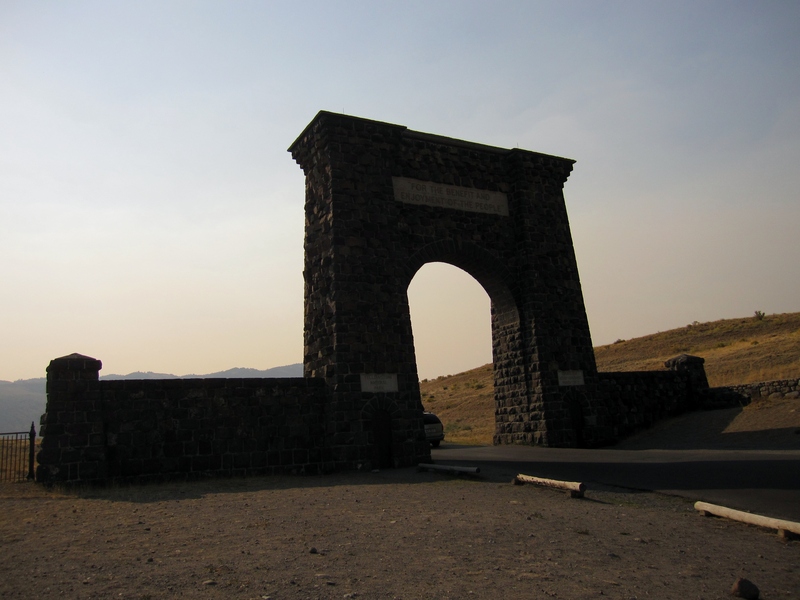 The next morning I filled up in Gardiner and stopped to take a picture of the Roosevelt Arch at the park entrance. Unfortunately the sun at that time of day was not at a good angle. 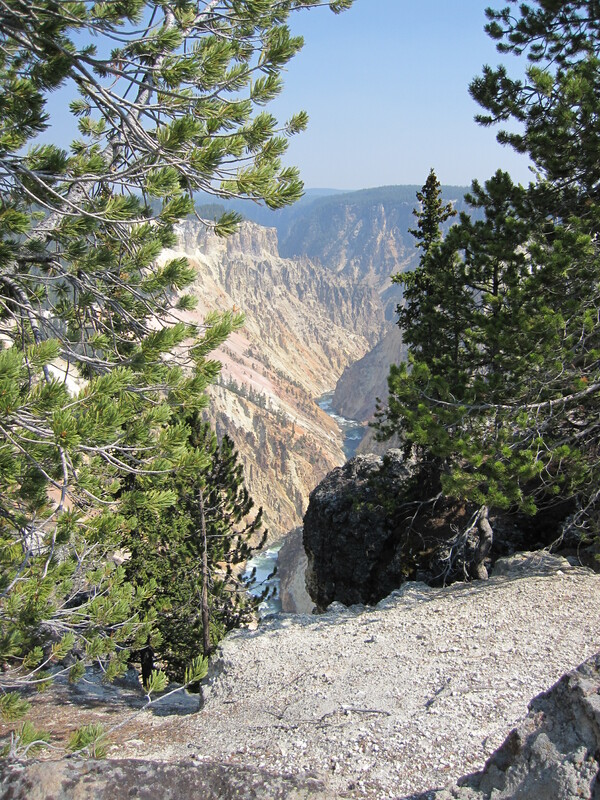 From there we drove to Tower Junction, then to Canyon Village, where we checked out the Grand Canyon of the Yellowstone and the Upper and Lower Falls. Really amazing, beautiful, diverse country. As you drive along the scenery is constantly changing. And the rivers are amazing. I noticed in Wyoming that the rivers are all really alive, rushing along, over rocks, beautiful colors, all very lively. I went by Norris Campground, but it was full again. I had no signal to call or email Dwight, plus it was Wednesday, the 5th, the first night of NFL games. 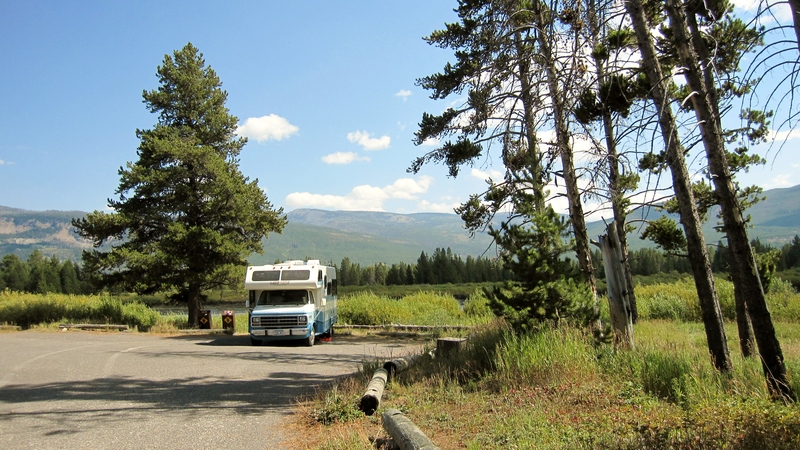 I decided to go to West Yellowstone, Montana (right outside the park) and get a commercial campsite where I would have electric and could watch the game. I’d have Verizon and phone, could charge up, and take care of the tanks. The next morning Dwight called. He had gotten a signal and was able to get my messages. I headed back to Norris, seeing a bison right next to the road. 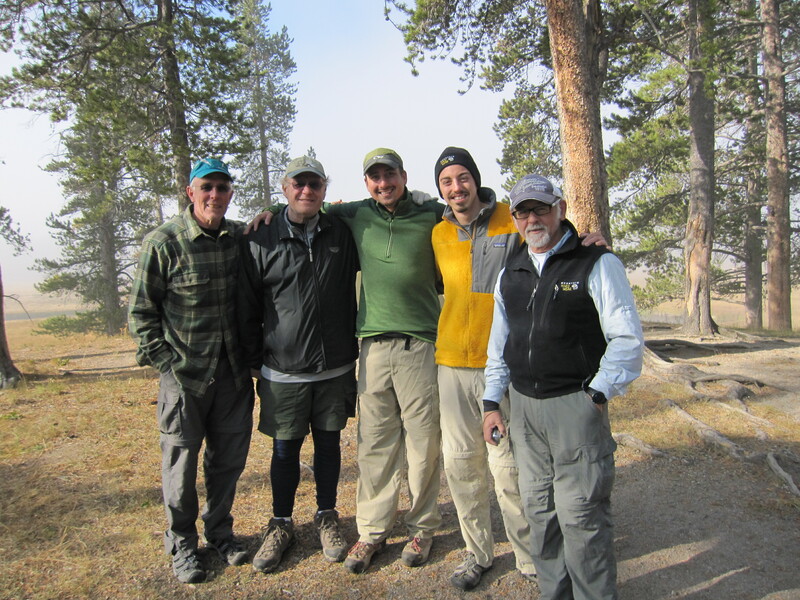 At Norris I got to meet the ‘Mountain Men’, a group that camps at Yellowstone every year. Dwight and Scott grew up in the area, Ernesto is their friend from Guatemala, and Nathan and Paul are Dwight’s sons. Normally they go back-country camping, but this year they decided to camp at Norris and explore more of the central park areas. They had 2 fantastic campsites together and I was able to park there with them for Thursday night. We had a great time and it’s always good to see Dwight. (We worked together, but for different companies, and in different cities.) What a great group of guys!! 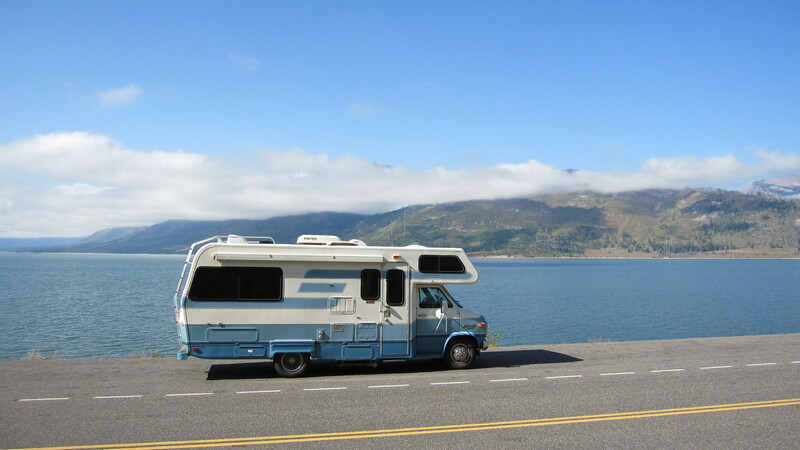 Scott’s wife would like to get a motorhome, so he took a good look at my Lazy Daze. I think he was a bit surprised at how much can fit into such a small size. (Personally, I think I have everything I could possibly need, except solar.) It got down below freezing that night. I’m glad I didn’t take too long getting to Yellowstone. It gets cold in a hurry up there. On Friday morning we went our separate ways. 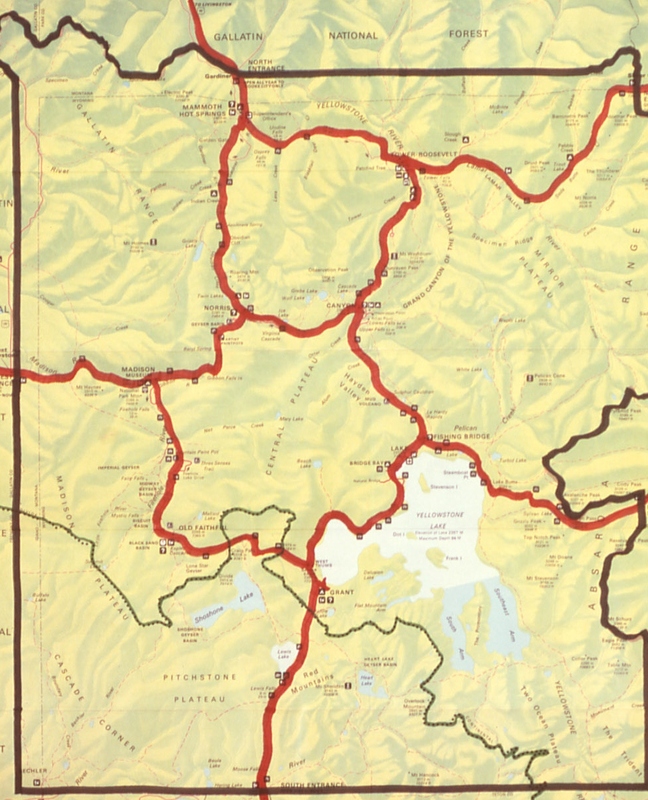 I was heading up to Montana – to Ennis, Bozeman, and the Madison River. 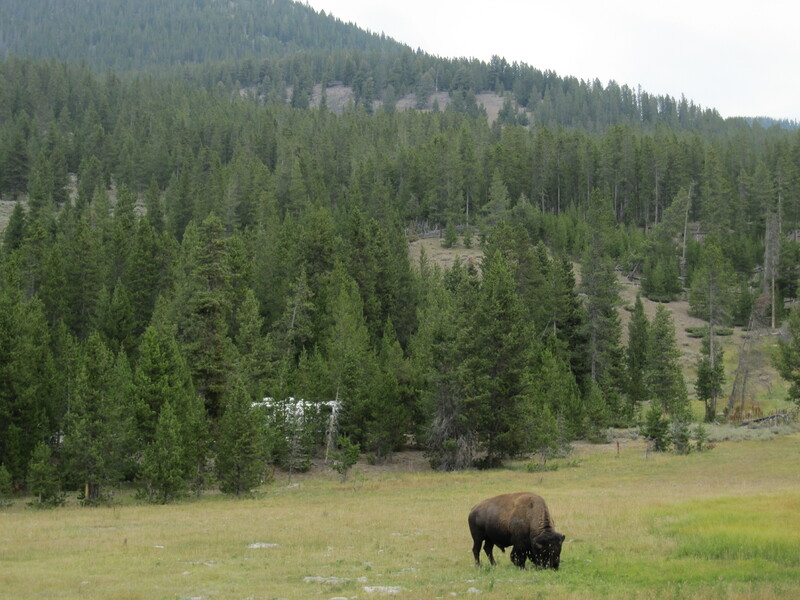 By the way, Yellowstone was busy. Guess a lot of folks had the same idea to go right after Labor Day, especially the tour groups. 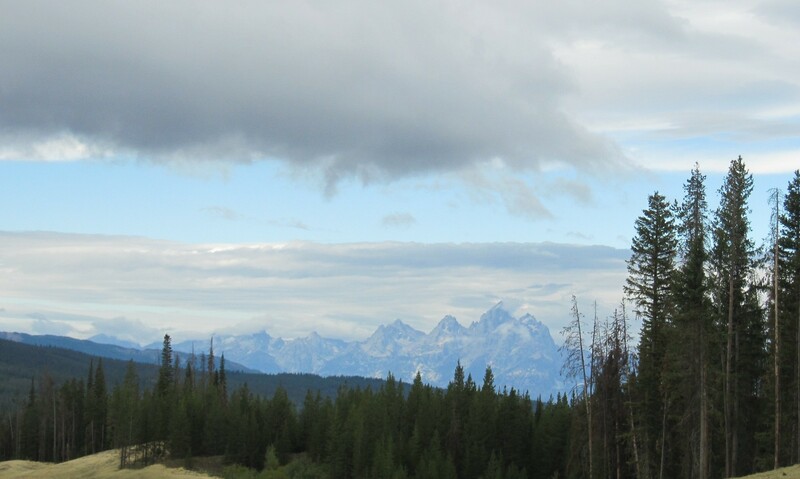 Still, glad I went at that time, and certainly glad I got to see Yellowstone and the Tetons. 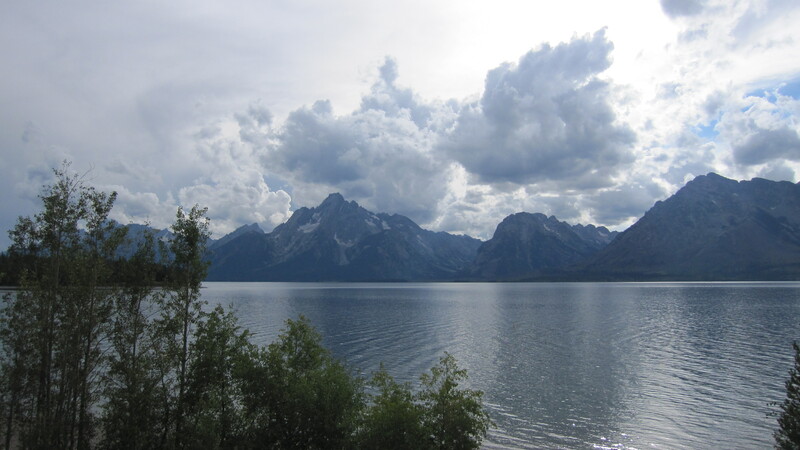 Between the Grand Teton and Yellowstone National Parks is the John D. Rockefeller, Jr. Parkway. That’s the name of the road, and also the name of the area that connects the two parks. 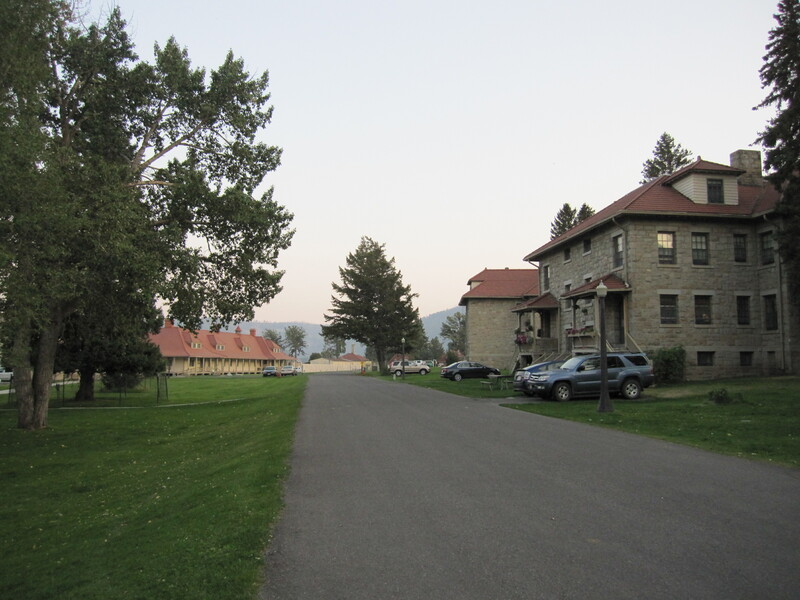 Grassy Lake Road comes off the Parkway and goes behind the Flagg Ranch resort complex. It runs along the Snake River for a few miles, then connects to Ashton, Idaho. 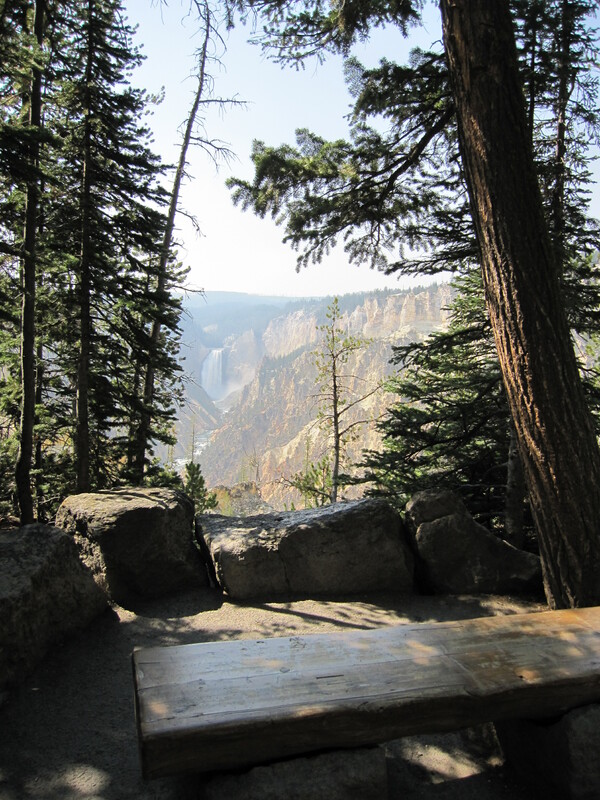 The road is reported to be very rough, but the first few miles aren’t too bad, and the Park Service has constructed several mini campgrounds there. It’s free to stay for up to 14 days. I stopped at the 2nd campground, which has 2 campsites. One site had a tent but no car, and the other site was vacant. I grabbed the vacant site and hoped the tent didn’t belong to an axe-murderer. Grassy Lake Camp. The little building on the left is a new rest room (pit toilet) constructed by the Park Service. After getting level and setting up, a car drove up and I got to meet my neighbor. It was a young woman named Gillian, solo camping with her newly adopted dog – a Chihuahua named Mouse. Gillian had been living in New York, but was originally from Scotland, so had just the best accent. We had a great time talking about how we each took to the road (many similarities), our plans, and had fun playing with the dogs. She left early the next morning, as she had many miles to make that day. She was such a lovely, fantastic, free-spirit I was sorry we didn’t have another day or 2 to visit. That’s one of the hard things about traveling around – you meet fantastic people and make great friendships, but the time is too short before saying goodbye. 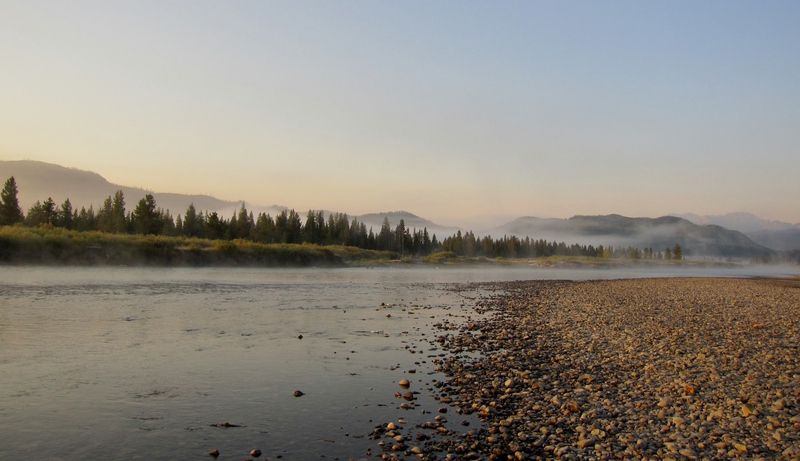 The Snake River runs directly behind the campsites, and in the mornings there would be fog in the area and mist over the water. It made for great pictures. Usually there were fisherman further along the river, and I often thought about how much my friend Chris Turner, an avid fly-fisherman, would love that site. After Gillian left some deer came by, checking on the site. The National Park Service patrols the campsites, both with rangers and a very nice retired volunteer gentleman. He told me there were other campsites further up the road (I was aware about just the first 2 campgrounds), so Riley and I took a walk up the road a mile or so to check out the other sites. We met another lovely woman, Jen from New Jersey, solo tent camping out of her car. She too had quit her job and hit the road. 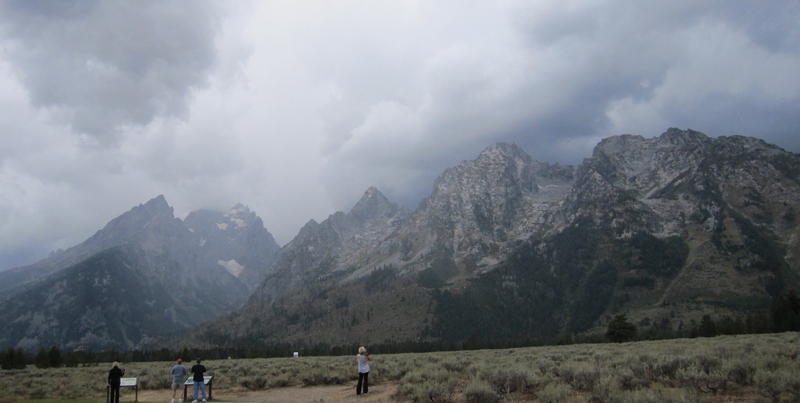 Her goal was to do some back-country hiking in the Tetons, so was very excited to be there and close to her dream. We talked for a couple of hours, then later, she came to visit at our campground. 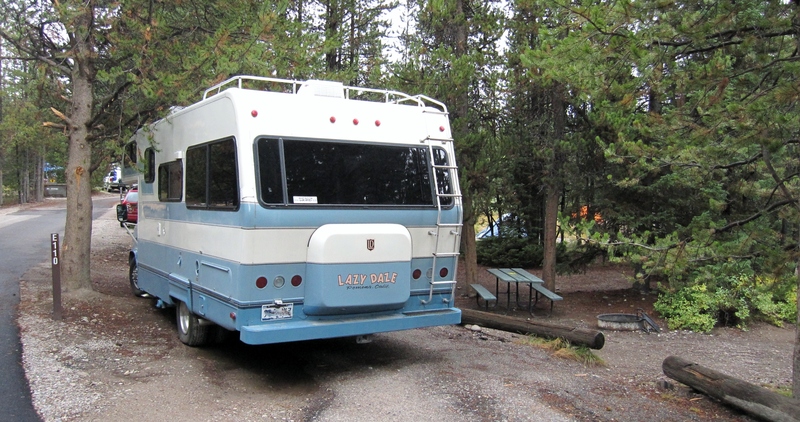 Turns out she had been camped next to me at Colter Bay 2 days before, and really liked the look of my Lazy Daze motorhome. She was surprised and glad to see me in the same area, but had camped further up the road since our little 2-site area was full. So, I gave a tour and we talked a couple of hours more. 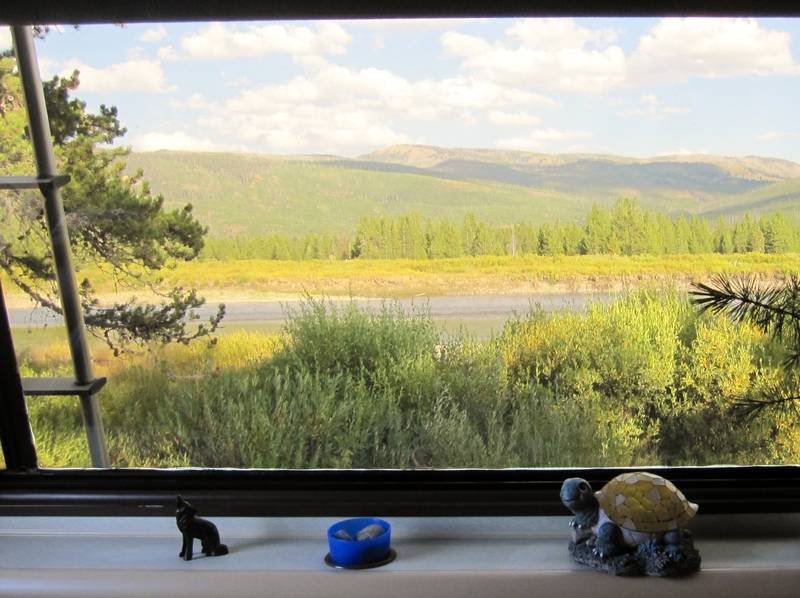 I was planning to leave the next morning to go to Yellowstone, and we arranged for her to come by and take my site, as it was nicer than the one she had up the road. Again, I made a great friend and was saying a sad goodbye to head on to the next part of my trip. I love a campsite with a nice view! I had stayed Sunday/Monday, Sept. 2nd & 3rd at the Grassy Lake Road camp. Now that Labor Day had passed I wanted to get to Yellowstone, since the crowds should be smaller than during the ‘summer season’. 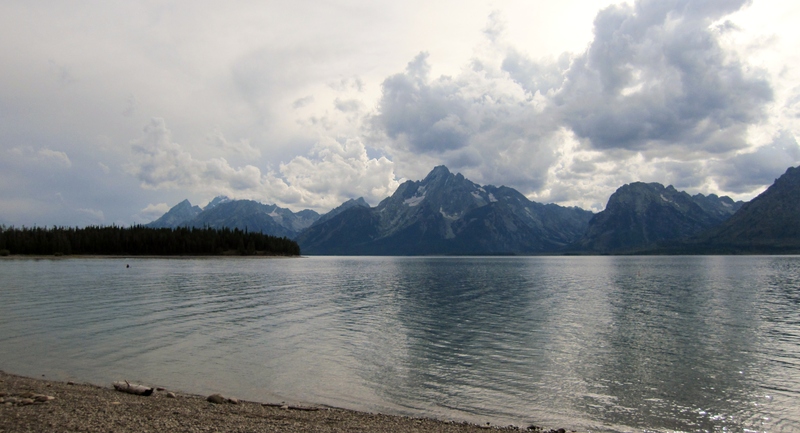 There would be a lot to see there, and I planned to meet my friend Dwight, who was in Norris Campground. I have a LOT of pictures from Yellowstone and will post on that part of the trip soon.